For some reason, I am terribly preoccupied these days. I lose track of what I was doing and the only way to stay sane is my multiple to-do lists. I am spending a lot less time at the laptop, but my phone bills are testimony to the amount of time I am connected online, monitoring the FB page and emails and other stuff. Such is my preoccupation, that on the last trip to the bank, I wasted not one, but three cheque leaves because I either entered wrong numbers or signed where I wasn’t supposed to! I spend over 45 minutes gazing at the stuff on the shelves in the supermarket and will forget to bring home something basic like sugar. Not that I am overworked, I am just forgetting stuff. I’ve been posting recipes here with a lot more frequency than this blog is used to, and yet forgot to tell you something important that I am part of. Sometime in March, when I went to Goa on vacation and met up with two of my favourite bloggers Aparna and Revati, we decided to finally make a blogger’s meet happen. We had been talking about it for a couple of years, but this time we decided to stop talking and start doing. If you are connected with me via FB you will know, that the first ever Indian Food Blogger Meet is happening in Bangalore. It will be held in August on 1-2 and promises to be a two day celebration of blogging and bloggers. We have a lot of interesting and useful session lined up and I cannot even tell you how excited I am that an idea that I had in my head is actually taking shape in front of my eyes. If you want to know more about this, connect with us on FB or follow us on twitter. We even have a blog which will have all the updates. For each one of us involved, with a different sensibility, skill set, located in a different city, with multiple things happening in our offline lives, yet we have managed to do all the main things and invite people who will add value by sharing their blogging journey. There is a lot more to do in terms of typing up loose ends, but the agenda has been put together after much thought and aimed to be of value to the participants. I am delighted that speakers, some of them very respected bloggers are travelling from across the country to be at this meet. If you are a blogger and would like to be a part of this, here is the information on how you can participate. Thank you for the overwhelming response to the post about Amma’s operation. I am happy to update that she is recovering well and is active. Each comment both here and on FB was read to her and she has expressed her thanks. I had friends and family calling me all through the day of the operation. My classmate from college when to a temple and dedicated 1008 chants to her, Amma’s best friend was at the Kanakadurga temple at Vijayawada when I texted to tell her that everything went well and offered special prayers in thanksgiving. Some friends and family woke up at 4 AM and prayed through the time of her procedure. Aunty E was praying and waiting by the telephone for an update. My MIL stayed by my side, carrying water and sandwiches that FIL had made so that I would have moral support. I am overwhelmed with the goodwill that Amma enjoys. Whatever be your faith, the circle of love, prayers, healing energies and spirit enveloped us as a family and Amma especially is something I am extremely grateful for it. The yeast must activate for this recipe. If the yeast does not froth, the pizza won’t be puffy and soft. Mix the flour with the salt. Add the milk and yeast mixture to the flour and knead into a dough. It should be softer than chapati dough, but not soggy. Put the dough onto a surface with some dry flour and knead it gently for 3-4 minutes till it becomes soft and spongy. Add the butter and knead it completely. Put it in a clean bowl, cover with foil or a damp clean towel and let it rise to double, for about 30 minutes. Preheat the oven to 200 C. Prepare a baking sheet by brushing it with vegetable oil. Divide the doubled up dough into two or three parts. Make it into a round ball and flatten gently. Sprinkle with some dry flour and roll into a round, like a roti. The thickness of this should be about ⅓ inch. Prick it with a fork and place it on the baking sheet. Repeat with the remaining dough and place on the baking sheet so that the pizzas don’t touch each other. Bake for 10-12 minutes or until the edges are golden brown. Remove from the oven and cool for 6-7 minutes. 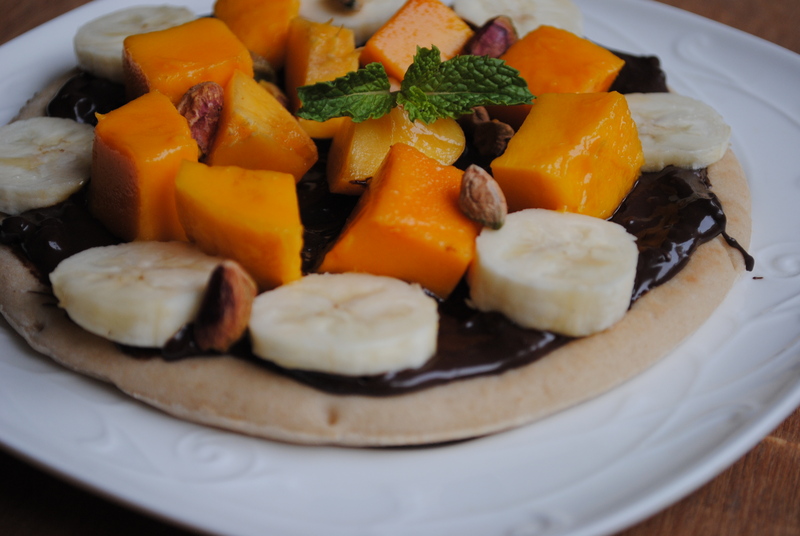 Spread nutella on the top of the cooked pizza, arrange fresh cut fruit on top, sprinkle the nuts. Cut into triangles and serve immediately. Okay dyu think this preoccipation and multiple to-do-lists and general sense of forgetfullness is a summer-induced thing. I read this nodding right through, and felt vaguely reassured that I am not the only one currently suffering from the affliction. I find myself telling myself to “get offline and get a hold of myself” several times a day, and yet the number of times I actually follow thru doesnt match up. 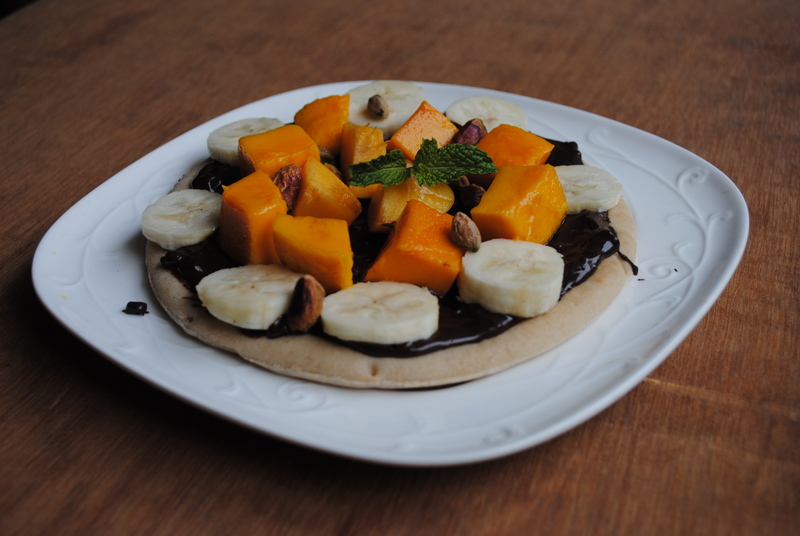 Cold fruit, nutella and a warm pizza base sounds delish right now! I’m hoping it is summer induced because I’m doomed if it is anything else. I felt a never before kind of unexplained lethargy and listlessness which gets amplified by unending hours online. I do nothing except hop aimlessly from one website to another. I’m seeking nothing – information, recipes etc. and realise suddenly the day is almost over, I’m tired and it has been an unproductive day. This week I deliberately cut back online time and the amount of work I’ve been able to get done has been tremendous. As is obvious, even the blog has benefitted. Hi Arundathi, this is so interesting and so simple.Keep sharing with us all these lovely recipes.!! !